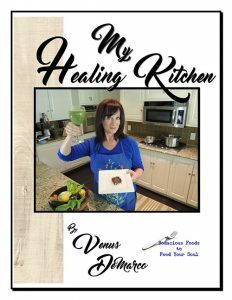 My Journey That Healed Breast Cancer and My Life, Through Faith, Food & Fun is Venus’ story of natural salvation from one of today’s most diagnosed diseases. This memoir will take you along on Venus’ life-changing (and at times humorous) adventure as she looks cancer in the face and with God’s help defeats it. This story will educate and inspire you to live a fuller and healthier life and to see the possibilities found along the road less traveled. I had no idea that, that was a sneak peek of the book that hadn’t been released yet. I read this book on the airplane and all I can say is absolutely amazing. Her story is incredible, her sense of humor is contagious, and that will lift the spirits of anyone that has ever had cancer or anyone that just needs to be inspired of what it takes to push through the challenges that life throws at us. I am encouraging every single person reading this post to pick up a copy of this book and allow yourself to be inspired by a true hero and a true champion. 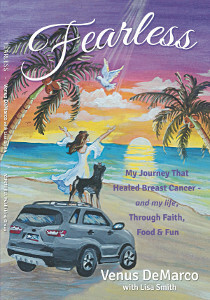 A fabulous true story of healing cancer through God’s word, works and guidance. Knowing Venus personally after her healing is further testimony of her continued walk in faith and that she truly walks the talk. Please take the time to read as her story moves through her journey from a death grip breast cancer diagnosis to the Truth of God’s promise to heal as she reveals with her “clean” diagnosis.